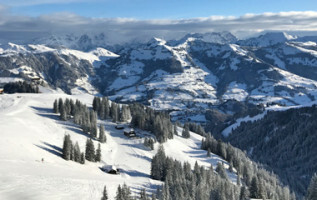 Some ski holidays are memorable not for the powder snow, not for the après-ski but for the spectacular lift ride up the side of a steep cliff face. Despite recent investments in lift infrastructure, many ski resorts in the Alps and abroad persist in using their antediluvian cable cars to shuttle terrified skiers and snowboarders up – and down – their ski areas. We’ve sought out the 10 strangest lifts in Germany, Austria, Switzerland, Italy and France – plus a bonus lift all the way across the pond in Canada! Knock these off your bucket list if you’ve a head for heights! The spectacular Aiguille du Midi cable car at Chamonix Mont-Blanc was inaugurated in 1957 and takes passengers on a 5km ride up the mountain from the heart of Chamonix. The views of Mont Blanc are stunning, but try telling that to the 110 gondola passengers who were trapped overnight here in 2016 and had to be rescued by helicopter! This venerable lift has been in operation for almost 90 years, making it the oldest original lift in the Alps. Whether you’re a skier, a snowboarder or a regular old pedestrian, step onto this lift and you’ll step back in time to the year 1928, when the lift carried winter sports enthusiasts up the Predigststuhl (1614m) for the very first time. If you’ve ever taken a ski holiday at Alpe d'Huez, you might have experienced a terrifying sinking feeling as the chairlift to Auris en Oisans started going DOWNHILL into the valley soon after you boarded. With gut-churning doggedness, the lift continues to plunge along the steep cliff face before finally curving upwards to bring you up the other side. The worst part? You have to take this very same lift to get back. The rather outdated Freccia cable car in the Cortina d'Ampezzo brings skiers and snowboarders up to the dizzying altitude of 3000m, during which you’ll be experiencing a slight feeling of unease as you listen to the strange sounds coming from this ancient contraption. If you’ve seen the movie Cliffhanger with Sylvester Stallone, one ride on this rickety old lift will be enough for you to understand why they shot this film here. The G-Link gondola in the Salzburger Sportwelt spans the ski resort of Wagrain and measures about 2km in length. You’ll need a good head for heights – or a deep sense of appreciation for scenic mountain views – to make this ‘flight’ from Grafenberg to Griessenkareck. Until very recently, the Peak 2 Peak gondola in Whistler Blackcomb held the world record for the longest unsupported span between two towers, as well as the longest distance to the ground – 436m at the highest point. The cable car measures over 3km, during which you’ll have ample time to appreciate the Canadian mountain scenery, especially if you were lucky enough to get the cabin with the glass bottom. You’ll have to muster all your courage to tackle the ascent up the Valluga cable car in Austria’s behemoth Ski Arlberg linked ski area. But once you pass the first part, the worst is over – and the entire journey takes just 5 minutes, whisking you up to 2647m in what seems like no time at all. Like at L’Alpe d’Huez, the Leissieres Express in Val d'Isère mimics a roller coaster, bringing you up the mountain and then BAM! spitting you straight back down the other side. This chairlift isn’t for the faint of heart! 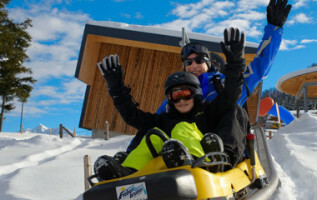 Mayrhofen's Penkenbahn is legendary among skiers and snowboarders who have visited this beloved Austrian ski resort. Even after having been recently rebuilt, it still provokes shivers up the spine for some snow sports enthusiasts. But it’s completely worth it, as the slopes of the Penken are just plain awesome. 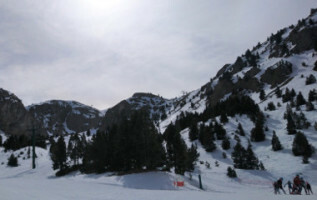 The Vanoise Express in France connects the ski resorts of La Plagne and Les Arcs in the Paradiski linked ski area. Right off the bat, you’ll find yourself dangling 380m above the valley – and this is in a gondola that can fit up to 300 people per cabin! Insane.